This small ferry arrived at Greenock on Friday and will be drydocked for annual survey together with the paddle steamer WAVERLEY on Monday. She is FOYLE RAMBLER, built in Germany in 1972 and operated on a crossing on the River Weser, under her original name STEDINGEN. 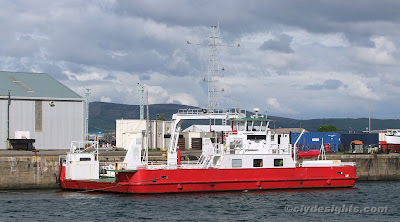 In 2004, following the opening of a new road tunnel, she was sold to the Lough Foyle Ferry Company for service on Lough Swilly between Buncrana and Rathmullan. In previous years, this ferry has been towed across from Ireland to the Clyde for overhauls, but this year she made the crossing on her own. Prior to coming to Greenock, FOYLE RAMBLER had her car ramps removed.